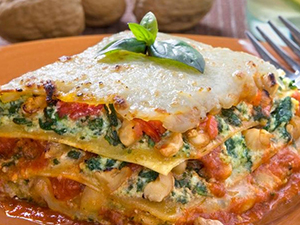 An ounce of walnuts contains four grams of protein, and when combined with the cheese in this meatless lasagna, the recipe makes a protein-rich vegetarian menu item. Preheat the oven to 350°F. Lightly oil a 9 by 13-in. baking pan. Finely chop spinach. Prepare Cilantro-Walnut Pesto: Place basil leaves and garlic in a food processor or blender; pulse to mix well. Add walnuts; continue to blend until nuts are finely ground. Keep the machine running while drizzling in olive oil. Process until smooth paste forms; transfer to bowl and stir in Parmesan. Season to taste with salt and pepper. Place ricotta cheese in large bowl. Stir in chopped spinach, Cilantro-Walnut Pesto, garlic, salt, pepper, half the Parmesan and walnuts. Mix well. Spread half the marinara sauce in bottom of oiled pan. Place a layer of lasagna noodles over sauce; Spoon about 1/3 the ricotta on top and sprinkle with 1/3 the grated mozzarella. Repeat layering, finishing up with a final layer of noodles and reserving a little Parmesan. Bake 40 minutes; sprinkle on the reserved Parmesan and bake 10 to 15 minutes longer. Remove from oven; let rest 10 minutes before serving.